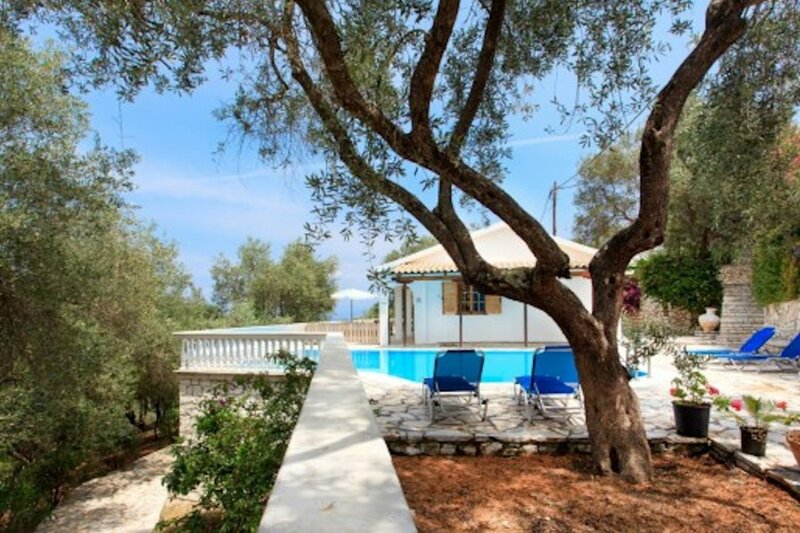 Located on the quiet coastal road nestling between olive groves. Located on the quiet coastal road nestling between olive groves, Villa Kipari is a bright and spacious property with stunning views across the crystal blue waters of the Ionian to the Epirus Mountains on the Greek mainland. The accommodation comprises of two bedrooms, one double and one twin, two shower rooms and an extensive living area comprising of a comfortable sitting room with, dining area and a well-appointed kitchen with modern appliances. One of the features of this property is the extensive outside space, a large terrace constructed of local Paxiot stone with a covered dining area for al fresco dining and a swimming pool with sun loungers to swim and sunbathe in total privacy. The pool area is separated from the terrace by a trellis fence, offering total peace of mind for families with young children. If you can stir yourself away from your private pool and terrace, the sparkling waters of Kamini beach are only five minutes away with Gaios, the main town of the island bustling with café bars and restaurants, a twenty minute stroll along the quiet coastal road and captivating harbour promenade with its traditional fishing boats and sailing yachts.